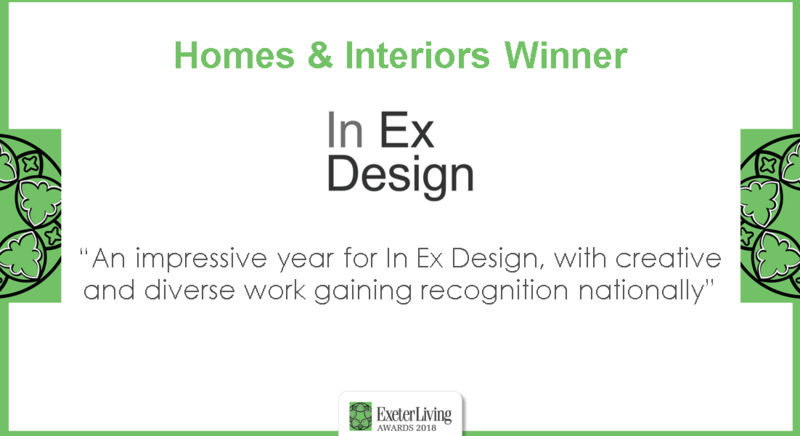 We are delighted to have been announced as the winners of the Exeter Living Award 2018 for Homes & Interiors. We are so grateful to have been nominated in a category with so many other talented businesses; De Viell, Howdens Joinery Sowton, Intelligent Abodes, La Fabrico, System Six Kitchens and Woodford Architecture and Interiors, to name them all, let alone win. Receiving the award is really a representation of how In Ex Design is expanding, not only as a practice, but as a combined service, providing insights into Architecture, Interior and Landscape Design. The integrated nature of our practice and our breadth of experience allows us to undertake a wide range of projects, with clients ranging from commercial enterprises to private residential clients. Our Interiors team are busy on schemes which include the refurbishment of the Children’s Oncology Department at the Royal Devon and Exeter Hospital and detailed design scheme for a house on the River Teign in Shaldon. We have also just completed a courtyard garden design in Lympstone and an office fit out in Oxford. Our diverse range of skills allows us to be involved in many different types of projects, which certainly makes every day interesting and different! Every project and certainly every client is an individual and we treat them as such. We give everyone a bespoke service and each design is tailored around what each client needs, which is why we are so grateful to be recognised amongst so many other prestigious businesses as innovators in homes and interiors. The evening itself, set up with candelabras, was beautifully orchestrated and the food made the evening even better (not to mention the Prosecco) – we cannot wait to attend the Winners’ Dinner to celebrate with our fellow victors and we look forward to the growth of In Ex Design in the future and many more awards! Head over to https://www.exeterlivingawards.co.uk/winners/ to see our director Julie-Ann and all the other winners’ celebratory pose!